This article has its origins in a paper “Towards an Economic Solution for Kashmir” which circulated in Washington DC in 1992-1995, including at the Indian and Pakistani embassies and the Carnegie Endowment, and was given as an invited lecture at the Heritage Foundation on June 23 1998. It was first published in The Statesman, in three parts, on Dec. 1-3, 2005. India, being a liberal democracy in its constitutional law, cannot do in Jammu & Kashmir what Czechoslovakia did to the “Sudeten Germans” after World War II. On June 18 1945 the new Czechoslovakia announced those Germans and Magyars within their borders who could not prove they had been actively anti-fascist before or during the War would be expelled — the burden of proof was placed on the individual, not the State. Czechoslovakia “transferring” this population was approved by the Heads of the USA, UK and USSR Governments at Potsdam on August 2 1945. By the end of 1946, upto two million Sudeten Germans were forced to flee their homes; thousands may have died by massacre or otherwise; 165,000 remained who were absorbed as Czechoslovak citizens. Among those expelled were doubtless many who had supported Germany and many others who had not — the latter to this day seek justice or even an apology in vain. Czechoslovakia punished none of its nationals for atrocities, saying it had been revenge for Hitler’s evil (“badla” in Bollywood terms) and the post Cold War Czech Government too has declined to render an apology. Revenge is a wild kind of justice (while justice may be a civilised kind of revenge). Thank you for republishing my article. 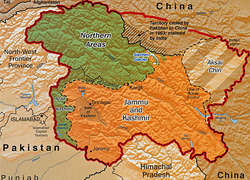 It is part of a series, that includes “Law, Justice and J&K”, and “History of J&K”. I welcome any comments/critique here and/or at Kashmir Seminar, a Facebook Group. Cordial regards.